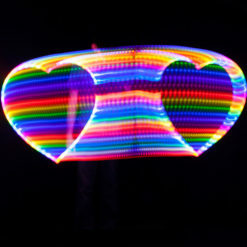 Mini hoops let you perform poi-style moves like weaves, flowers, and buzzsaws. Customize your Haze minis using any single color dotted-strobe LED. Sold as a pair. Seamless connection with a removable battery. 5/8″ or 3/4″ OD tubing in HDPE or Polypro. Moodhoops Hoop Wax added for grip.Contact us if you'd like these hoop wax left off your hoop. Glow all night, with additional rechargeable batteries.